Before you can take ownership of a franchise, you must sign a franchise contract. Also called franchise agreements, these complex documents govern the terms under which you will be allowed to conduct business and the rules you will need to follow as a franchisee. Franchise contracts are usually detailed and lengthy, and are not something you want to sign without reading and understanding all the terms contained within their many pages. Here are the main provisions covered in most franchise contracts. 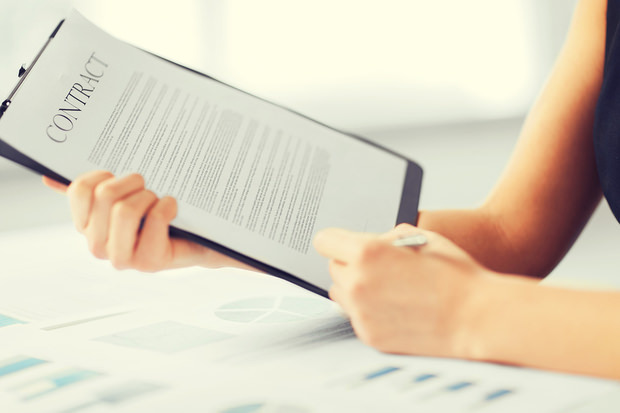 It's important to know what to expect before looking at contracts so that you can make an informed decision about whether to accept a franchisor's terms. Franchise contracts are legally binding, so be sure that you can abide by the terms before signing. Each franchise location covers a certain area, which is spelled out by the franchise contract. Other franchisees cannot have their locations within a certain number of miles. This is done to make sure there isn't too much competition in the area, which can limit sales potential and the success of the franchise location. It is standard for franchisors to train new franchisees and to give them ongoing support. Franchises are built around uniform business practices, and training will help new franchisees understand what is expected of them and learn the practices that have given the franchise company success. Ongoing support can take the form of continuing training, discounts on equipment and supplies, and advertising subsidies. The typical duration of a franchise agreement is usually 10 or 20 years. This part of the contract will also spell out the conditions under which the franchise can be sold to someone else, which can be stringent to make sure that any future franchisee is qualified to be an owner. Sometimes there will be a right of first refusal clause that allows the franchisor to buy back the franchise rather than have it sold to someone else. Besides the initial purchase fee, this part of the contract covers the costs involved in owning a franchise, including monthly royalties, advertising buy-ins, and other costs. Many franchise contracts also include stipulations on how much cash franchisees must have available before purchasing the unit, so that franchisors know that their franchisees will be able to cover everything from payroll to equipment repairs and upkeep of any property involved. The franchisor owns the trademark, various patents and the signage associated with the franchise. This part of the contract outlines the specific ways a franchisee is permitted to use those entities, as well as the ways they are not permitted to use them. Each franchise has specific rules for the way franchisees must run their units. These can include hours of operation, specific items or services sold, and pay scale for employees, among many other things. Managerial structure, software programs used, and the way a franchise location must be laid out are other items that may fall under rules for operating. Specifics about how a franchise can be renewed and under what conditions it can be terminated are included here. If a situation arises where the franchisor and franchisee are in conflict, there may be an Arbitration clause that would prevent either side from going to court unless an arbitrator reviews the case and makes a recommendation first. Can You Negotiate the Terms of a Franchise Contract? The vast majority of franchisors are not open to negotiating their franchise contracts. It is advisable to have a lawyer with franchise experience look at any potential franchise contract and give you an honest assessment about which parts of the contract may or may not be advantageous for you as the franchisee. It is important to note, however, that the franchisor's main goal in the contract is to protect the value and integrity of the franchise as a whole, as well it should be. If the entire franchise fails, none of the franchisees will have anything left. For this reason, most franchisors don't negotiate their franchise contracts, and it may even be unrealistic to expect franchisors to go out of their way to accommodate franchisees. If you find clauses in the contract that are non-negotiable for you, you can ask questions of your potential franchisor to find out why those clauses were included and whether the franchisor would consider taking them out of the contract, but chances are the franchisor will not negotiate on anything of any importance. If you feel the contract is unfavorable and would prevent you from getting a good return on your investment, your best bet is probably to pursue a different franchise with more favorable terms. There are good reasons why franchisors don't typically negotiate contracts. Most franchises have been in existence for years and have developed successful business models. They usually know what works far better than their franchisees do, and so they insist on setting up the contract in a way that they know will work out well for both themselves and the franchisees. In addition, franchisors have other franchisees that they have worked with previous to the current location. If they negotiate with you, how will their existing franchisees react? Negotiating might open up a door for existing franchisees to demand the same deal you got, or to become unsatisfied with their own contracts. Franchisors would naturally want to avoid this, which explains the policy of not negotiating on contracts. It is actually a sign of strength on the franchisor's part not to negotiate with potential franchisees, as Entrepreneur points out. It shows confidence in the success of their previous contracts and in their system of franchising. You should ask if negotiation is possible, but if the franchisor seems willing to negotiate any major points of the contract, it could very well be a red flag that there is some flaw in their business model. You may want to proceed with caution. Negotiations are uncommon for franchise contracts, but sometimes do happen for smaller items. There are some minor negotiations that may be possible with some franchise contracts. In these small areas, you may be able to get more favorable terms, but it won't really affect the main operating of the franchise. Newer, less established franchises are usually more likely to be willing to negotiate than well-established ones. Sometimes you can get additional support when you first open the franchise. Sometimes the franchisor's personnel will agree to be there during the grand opening to provide guidance and training, and some franchisors may even contribute to the costs of advertising and marketing for the brand new location. Some franchisors are reluctant to allow you to pay your franchise fee in installments, while others offer in-house financing. It doesn't hurt to ask for installment terms if they aren't offered, though. Defaults could cause you to lose the franchise if not corrected under the terms of most contracts, so getting an extension can help prevent this from happening. It is important to franchisors that their locations operate according to their standards, though, so corrections should be made as soon as possible. Most contracts include the signing of a personal guarantee, even if you form a corporation to own and operate your franchise location. Some franchisors may be willing to waive this guarantee or limit your liability if you can show that the corporation will be able to cover the loss should the franchise fail. You may be able to get a modification of the franchisor's right to buy back your franchise if you try to sell before your contract expires. If you want to attempt negotiation of even minor points in your franchise contract, you should have a lawyer negotiate for you. Lawyers are trained to handle legal matters and also have more credibility than you do alone. Furthermore, negotiations can quickly become more complicated than your experience can handle, so it's to your advantage to have a legal expert handling them for you. Legal help is typically needed even if you aren't trying to negotiate changes to the franchise contract, so you should consider it part of the cost of the franchise and budget accordingly. Having an objective and knowledgeable professional to help you evaluate the contract can save you from making a big mistake. Signing a bad contract could cost you thousands of dollars over the course of your ownership, so paying for legal help is actually a bargain in the long run. Having a lawyer go over your franchise contract should catch most of these issues, but in the overall franchise acquisition process, there are some situations that should give you pause. Here are some red flags that should cause you to proceed with caution. The research process should take four to eight weeks for most franchises and involves talking to the franchisor and others involved with the franchise, looking into the company and other franchise units, culminating in signing the contract and paying your first set of fees. If at any point your sales rep or franchisor tries to rush you or push you into signing quickly, it may indicate a problem with the contract. Proceed at the pace you are comfortable with, or find a new franchisor who is not going to rush you. Quality franchises usually spark stiff competition, so discount prices may indicate a lack of quality. Carefully investigate the reason for the discount. If it's to make franchisees feel as though they are getting a bargain, that's one thing, but if it's due to a lack of interest in the franchise opportunity, then you will want to research its potential very carefully before committing. The Franchise Disclosure Document includes contact information for the executive team as well as detailed information about the franchise's financials and lawsuits that have been filed against it. If there is worrisome information in these documents, franchisors may try to hold it back until the last minute so that you don't have time to review it properly or so they can explain (spin) it when they meet with you. It's probably best not to deal with franchises like this. These lists are not in themselves a red flag, but if the franchisor discourages you from talking to franchisees not on the list, that is a red flag. Franchisors shouldn't have anything to hide and should be open to your talking to anyone you wish within the organization. Some franchisors and representatives may advise you not to "waste your time and money" getting an attorney to review the contract, since it isn't negotiable. This should be a red flag, signaling to you that an attorney's help is essential. You may not be able to negotiate the contract, but you still need to know exactly what it contains and whether you can accept the terms offered or need to look elsewhere for a more favorable contract. Should you trust your instincts during the process of choosing a franchise? If you have a strong feeling that something fishy is going on, it's probably a good idea to at least investigate more. Many times, instinct comes from knowledge when you immerse yourself in an industry or concept. You may not be able to quantify your gut feeling, but it has a basis in what you know. Trusting your gut instinct alone may not be wise, but if it gels with what experts and professionals are telling you, that may be a good indication of the proper course of action. Franchise Gator offers franchise opportunities to those who want to pursue franchise ownership. Learn more about various types of franchise opportunities, including everything from travel, cruise, and hotel franchises to cleaning and maintenance franchises and even mobile franchises. There really is a franchise opportunity to meet every passion!